Are you looking for Christian Icebreakers? Running out of game ideas? Here are my collections of exciting and fun games for you to break the ice! I will be adding more and more icebreakers in the near future. Hope you like them! Pass present while music plays, player with present will do a forfeit when music stops. A judge to determine who holds the present when music stops. Prepare a boxed gift (chocolates, toy, sweets etc). Wrap first layer with paper. Write a forfeit on this paper (do a chicken dance, sing a song etc). Wrap 2nd layer and write another forfeit. Make additional layers if you want a longer game with more forfeits. 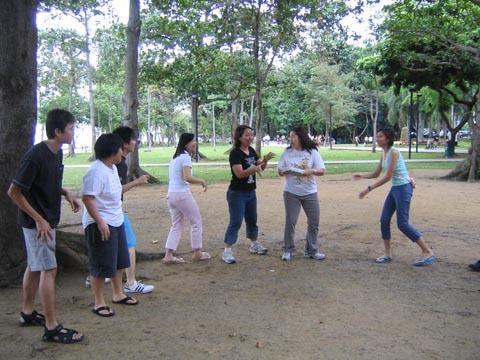 Players will stand or sit in a circle. Play music while players pass the present to one side. After 30 seconds, stop the music. Player with the present will have to tear away outermost layer and do the forfeit. Winner is the person who tears away the last layer of wrapping. The present belongs to him/her. Return From Christian Icebreakers, To Holy Spirit Led Christian.